I'm not quite sure what took me so long to check out THE Salt of the Earth, one of the most talked-about restaurants in town, to see what the hype is all about. 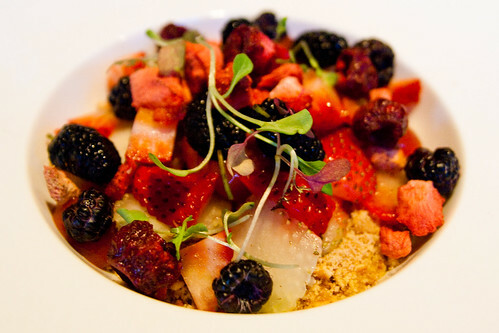 Most recently, the "hype" took the form of accolades from Pittsburgh Magazine, including Best New Restaurant for 2011 and Chef of the Year for Chef Kevin Sousa. I think that was the last draw. I had to be the last person in Pittsburgh yet to try Salt of the Earth, and that was just not acceptable. So I rounded up some friends and made my way there last week. First impressions: Sleek, clean, modern design; very bright and spacious, thanks to the uber high ceiling, the open concept, and the ceiling-to-floor windows that line the front of the restaurant. I absolutely loved the ambience. I didn't get to see the upstairs seating, but the lower level offers large communal tables and bar seats overlooking the open kitchen, not unlike eating at a sushi bar, only cooler. I knew they didn't take reservations (well, they do, for the upstairs loft, but I've heard it's better to just walk in), but the wait wasn't too bad on this Thursday night, considering we weren't to meet there until 7:00 pm. We got a seat at one of the communal tables, which at first pass may seem a bit odd, but it really didn't bother us at all. Despite being physically close in proximity to the other diners, psychologically the restaurant felt quite roomy. The menu, which varies seasonally, is written on a snazzy two-story chalk board. Creative menus always get me, and this was certainly one of the more intriguing ones I've seen, and made it difficult to choose among the options. While I was curious about the appetizers, I decided to opt for my usual combo: entree + dessert. 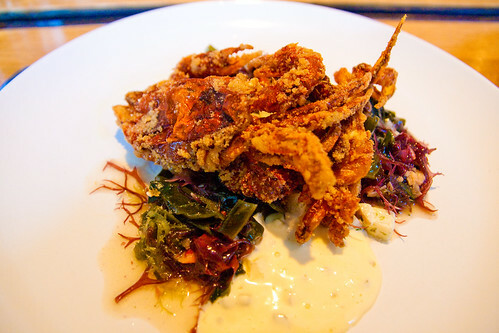 There was admittedly some agonizing over my entree selection, but eventually the Soft Shell Crab won out. And a superb choice it was! I can't say I've ever in the past had soft shell crab that was not overly crusty on the outside while retaining its juiciness on the inside. This was hands-down the best soft shell crab I've ever had. Served with a delicious tartar sauce, horseradish potatoes, and a gingery seaweed salad, the tartness of the sides complemented well the savoriness of the crab. Friend FoodBurgh Mike had ordered the Eggplant with tomato-braised soy protein and tahini. I'm always a bit wary of eggplant, but this was so interesting I regret not having taken a picture of it. The eggplant was cubed and made to resemble home fries, and I almost didn't believe it when Mike pointed to it and invited me to try it, but sure enough, when you bite into it, it is unmistakably eggplant. Very good eggplant, no less, as was the tomato-braised soy protein. Once again, it was a fabulous choice. This dessert consists of three layers: At the bottom is cream cheese and mesquite, topped with sweet and salty crushed pretzels, finished with a variety of fresh berries. Mike informed me that the pretzel jello (which contains actual jello, along with cream cheese and pretzels) is a "Pittsburgh thing." I've never had it before, but I don't think I can after tasting Chef Sousa's delightful - no, heavenly, version. Salt of the Earth certainly backs up its hype with solid quality. In my opinion, Salt of the Earth really is a step above most other restaurants in town, and I think it is good for the city to have such a high-caliber restaurant to raise the bar for the rest of them. I pretty much wanted to go back as soon as I walked out, and I'm marking this one an instant favorite.